I use this marinade all the time! It is best with boneless, skinless chicken breasts or center cut boneless pork chops. Lemon or lime can be substituted for the orange, although with chicken I really prefer the orange – it is the star flavor. 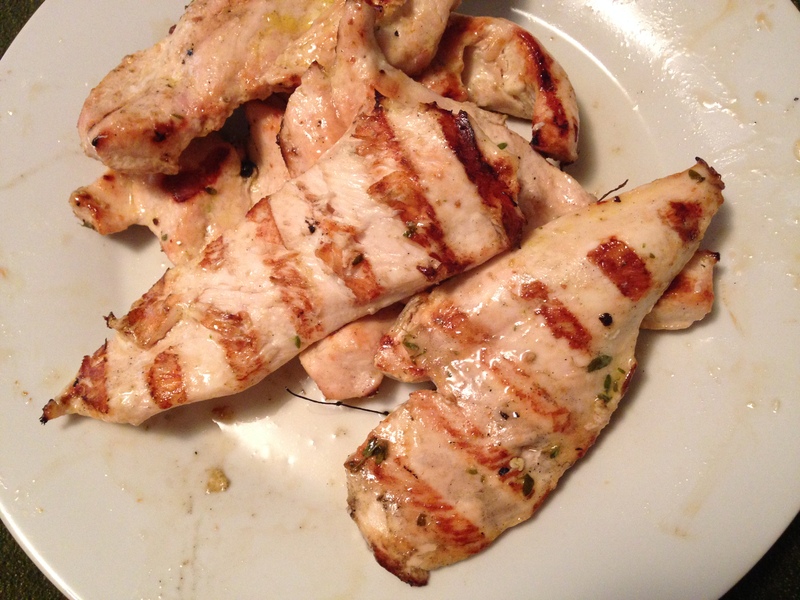 Garlic adds a nice flavor, and when I use garlic the chicken reminds me of Greek chicken. If you don’t have any garlic in the house – you can skip it. Clean the meat, dry it off and pound it with a meat mallet to an even thickness. Clean and cut the citrus fruit into quarters. 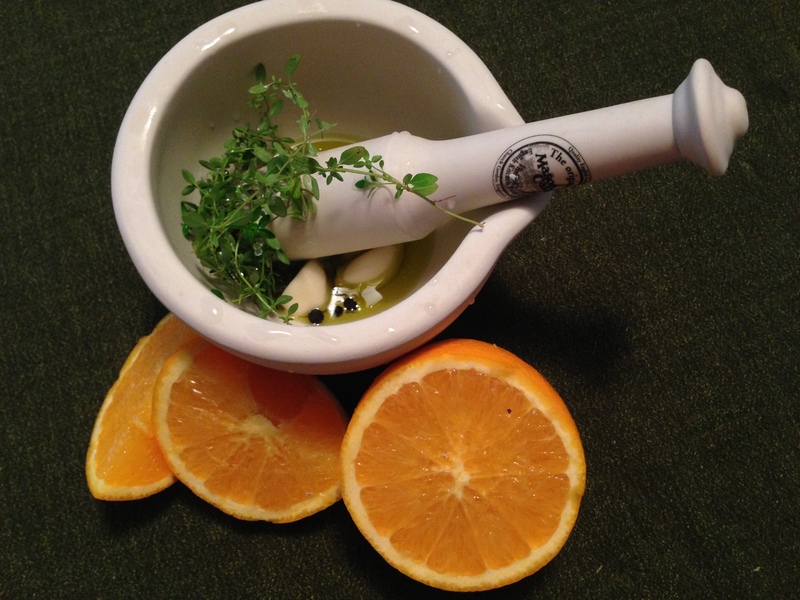 Squeeze the fruit into the bowl of a mortar and pestle with half of a bit of the olive oil. Put the fruit pieces into a 1 gallon freezer bag. Place all the rest of the marinade ingredients into the mortar and pestle bowl (or some other method to bash the herbs to bring out their flavors – the peppercorn and sea salt help to break up the herbs) and smash it all together. Once thoroughly smashed, pour the flavored oil into the freezer bag. Put the meat into the freezer bag, zip it up and then make sure you move it around to cover all sides with the flavors, massaging it into the meat. Marinate in the refrigerator for 30 minutes – 2 hours. Pat the meat clean and place on a plate sprinkling a bit more salt onto both sides of the meat – then hand it off to your local grill master to barbecue. Grill until the thickest part of the breast is cooked through and white, but try not to overcook. I suggest laying the flavorful chicken breast over a pile of homemade mashed potatoes letting the marinate ooze onto and flavor the potatoes, and accompany with something crispy like lemon bean surprise. Since you are grilling anyway, you can serve the chicken with grilled eggplant. Another idea is to slice the chicken into strips and lay them on top of a nice salad.